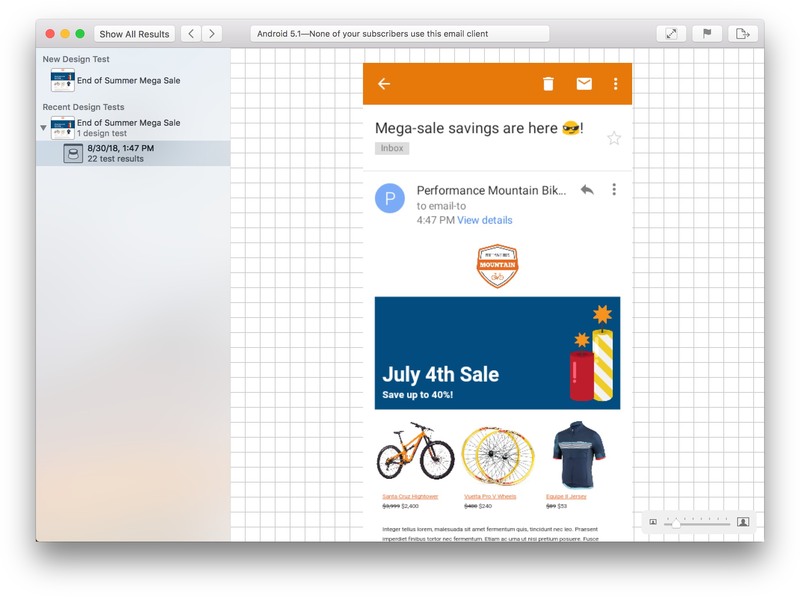 Direct Mail Design Tests are a way for you to see pixel-perfect screenshots of what your email looks like in a variety of email clients (including mobile, web, and Windows email clients). Design tests are a great way to spot potential issues with your email design, or gain confidence that your email will look great when your recipients open it. In previous updates, we improved the process of ordering new design tests. In this update, we have improved the experience of browsing test results. Screenshots now fill more of the available screen space, and navigating between results is faster than ever. We’ve also made it easier to export the screenshots out of Direct Mail. We wanted to make it easier for first-time users to learn about the powerful features packed into Direct Mail. New in Direct Mail 5.4 is a sample project that shows off some of the things you can do in Direct Mail. A guided tour at the top of the project window helps new users find their way around the app. The sample project and tour is available in the “Welcome to Direct Mail” window that appears on first launch, or at any time from the “Help” menu at the top of the screen. The improvements in Direct Mail 5.4 are more than just skin deep. We have squashed several bugs and streamlined the user interface to help you work more efficiently. We hope you to enjoy these new improvements, and look forward to your feedback! The Direct Mail 5.4 update will download to your Mac automatically over the next few days. If desired, you can update immediately by choosing “Direct Mail > Check for Software Update” from the menu bar at the top of your screen. Mac App Store customers will receive the update as soon as it is approved by Apple. Update: It has been approved, and Mac App Store customers can now download the update, as well.